When the 2016 World Series of Poker Main Event final table began on Sunday night, nobody thought Qui Nguyen had a chance at overcoming a field that included two former #1-ranked players on PocketFives, a talented European poker pro, a former PokerStars SuperNova Elite and two young American poker pros who cut their poker teeth online. 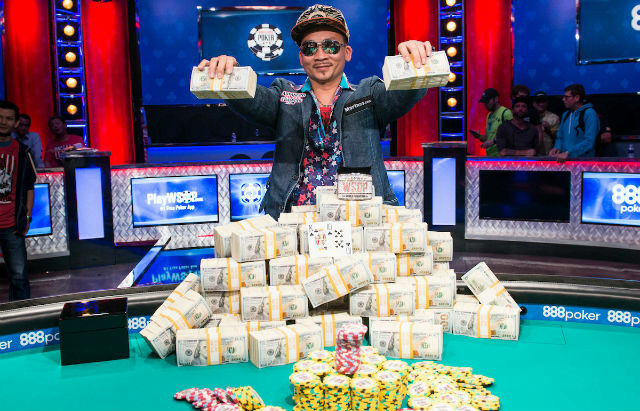 On Tuesday night in Las Vegas, Nguyen beat Gordon Vayo after a lengthy heads up battle to win the 2016 WSOP Main Event and the accompanying $8 million. Just like they did on the first night, when Nguyen and Cliff Josephy went at each other, things got crazy on the first hand Tuesday night. Nguyen started things off by raising to 2,700,000 with from the button. Josephy re-raised to 8,500,000 from the small blind with and Gordon Vayo got out of the way before Nguyen four-bet to 20,900,000. Josephy immediately moved all and after getting a count, Nguyen called. The flop gave Josephy top two pair. The turn clinched the pot for Josephy with the falling on the river. Nguyen’s stack dropped to 147,600,000 while Josephy more than doubled to 101,400,000. He also had momentum that proved to be short lived. Just four hands later the three players clashed in the biggest pot of the tournament to date and it nearly meant the end of the road for Josephy, the longest reigning #1-ranked player in PocketFives history. Josephy raised to 2,500,000 with from the button, Vayo called from the small blind with before Nguyen made 7,700,000 from the big blind with . Josephy and Vayo both called to see a flop of . Nguyen bet 9,900,000 and both Josephy and Vayo called. After the turn, Vayo and Nguyen both checked and Josephy bet 21,000,000. Vayo eventually moved all in for 75,100,000. Nguyen folded and Josephy called. The river was the and Vayo doubled up while Josephy was left with just eight big blinds. Josephy doubled up through Nguyen on the very next hand and then again four hands later through Nguyen to get his stack back to 46,200,000 – just 3,800,000 less than he started the final day with. Josephy’s roller coaster ride continued five hands later when Nguyen took half of his stack and officially ended on the very next hand. Nguyen folded the button, Josephy moved all in for 18,700,000 with and Vayo called with . The board ran out to eliminate Josephy in third place. After his elimination, Josephy discussed the set-vs-set confrontation with Vayo. When heads up play began Vayo had 200,300,000 chips to Nguyen’s 136,300,000. The two players exchanged the chip lead back and forth six times over the next 25 hands before Nguyen took the lead for the final time. Over the next seven hours of play, Vayo did everything he could to stave off elimination from the hard-charging Nguyen, but in the end, Nguyen’s aggression and unique approach that left his opponents dazed and confused over the final three days of play, ended up leading him to victory. After leaving Vayo shaking his head after numerous folds, the tournament ended in anti-climatic fashion. Nguyen opened to 8,500,000 with and Vayo shipped in his 53,000,000 stack with and Nguyen called. The flop gave Nguyen top pair and Vayo a boatful of extra outs but the turn and river were complete bricks for Vayo and after 181 hands of heads up play, Nguyen eliminated Vayo in second place to win the 2016 WSOP Main Event. Nguyen eliminated four of the final five players on his way to the win. Vayo should be embarrassed to watch that HU replay, get wrexked. GG Nyugen. GG Bax. Major League grind!!! limp limp limp! Great patience and emotional endurance from Vayo. Nguyen did great not overplaying his aggression. The telecast ran over 9 hours past scheduled broadcasting!!! Great drama! The Vayo Qs5s runout to stay alive was wicked too! !Yay poker!! I bet Qui Nguyen is totally Ungered up bout now….Either that, or he just purchased viet nam and let his mother pick any house she wanted…who knows!! Thank christ for his heavy accent…we wont have to worry about commercials and coaching videos!! His previous big win was for 52k…..